Your new home away from home! Our Bryce 2-person backpacking tent incorporates top notch features, high quality materials, and flexible pitching options to make it the perfect companion on your backcountry adventures. Paria Outdoor Products is a small business born in the mountains of Colorado. We strive to create high performance products that enable you to enjoy your time in the great outdoors. Thank you for supporting us. ►LIGHTWEIGHT - Newly updated to be 7 oz. lighter! The new Bryce 2P comes in at a trail weight of 3 lbs. 7 oz. and minimum weight of just 2 lbs. 10 oz. (footprint, no tent body). ►FULLY-FEATURED - Where do we start; two-way inner and outer zippers, mesh pockets, back vent with kickstand, pole repair splint, 12 Y-stakes and Dyneema guy lines, taped seams, 5,000 mm silicon/PU waterproofing, basically everything you find in high end tents at a fraction of the price. ►FLEXIBLE - Use the included footprint, poles and fly to quickly set up a minimalist shelter. Perfect as a weight-saving alternative! ►DURABLE - We did not skimp on quality materials; 20D ripstop silnylon/PU fly, 40D ripstop silnylon/PU floor and footprint, 20D No-see-um mesh, and 7000-series aluminum alloy poles and stakes. 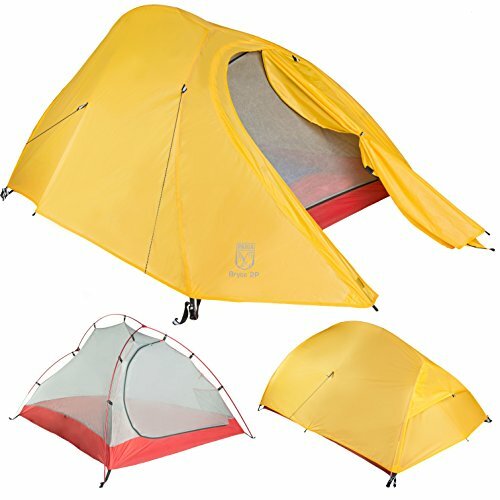 This tent will last for countless adventures! ►BUY WITH CONFIDENCE - We stand behind our products and offer a limited lifetime warranty. If you have any questions about this product by Paria Outdoor Products, contact us by completing and submitting the form below. If you are looking for a specif part number, please include it with your message.